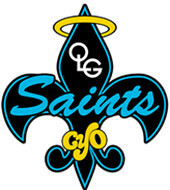 OLG CYO offers cross country in the fall and track and field in the spring. Track and field season begins February 1st and goes to the second week of May. New Players: New players are required to purchase a uniform singlet and dri-fit tee during registration. Returning Players: Returning players may reuse their uniform singlet and/or dri-fit tee, or purchase new items. Good pair of running shoes with laces (no Velcro or hi-tops). Running spikes optional. Uniform singlets must be worn during all track meet events. Uniforms should not be worn for casual wear or practices. Athletes choosing to wear a shirt under the uniform singlet may only wear the dri-fit tee (no other shirts are permitted to be worn under the singlet). Dri-fit tee may be worn over the uniform singlet during meet warm-up and when not competing in an event. Athletes will receive a bar-coded bib with his/her unique bib number to identify athletes during the meets. Athletes are responsible for keeping track of their bib throughout the season and wearing it to each meet. Replacements are not available. Athletes are responsible for purchasing their own black shorts and running shoes. Pyramid spikes, up to ¼”, are the only acceptable spikes permitted during meets. Spikes are not permitted at practices.